You can even omit the bacon if you don’t like meat. On the other hand, if you don’t mind the meat but don’t like the smoky flavor of bacon, use pancetta instead. I’ve done it in the past. It’s really good, too. 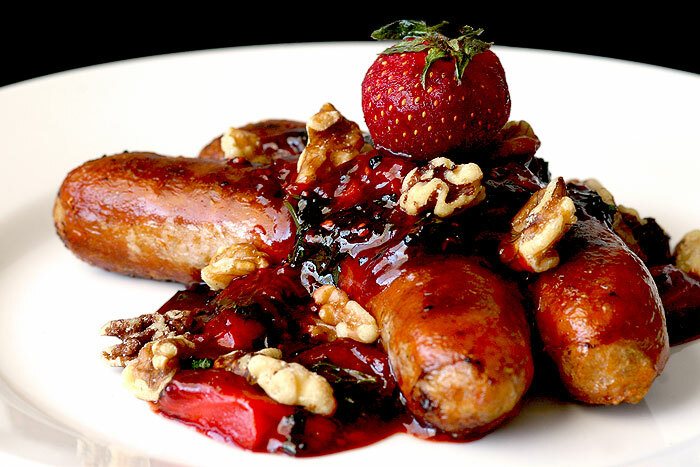 In a bowl, macerate the diced strawberries in a drizzle of balsamic vinegar. Set aside. Cook pasta to al dente. Meanwhile, saute bacon and shallots with a little EVOO in a medium-heated pan until bacon is lightly browned. Add in garlic and cook for another few minutes or until bacon is golden brown and crispy. When pasta is cooked, combine everything together, add in the strawberries, parsley, some grated parmesan and a few cracks of black pepper. Toss well. 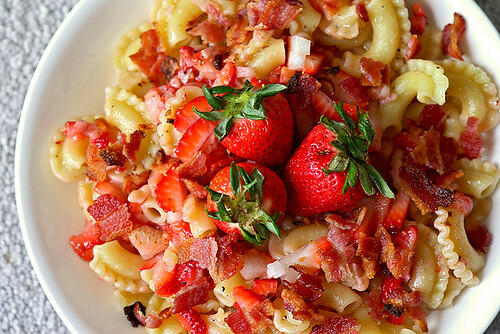 Serve on pasta bowls and garnish with some more fresh strawberries and parsley. Finish with a drizzle of EVOO. Why, look at that! I was lazy and didn’t want to cook tonight. Actually, I did eat the leftover stew from last weekend. And of course… this! Yum!!! Easy recipe here, folks! Mix together spring greens (any combination of romaine, swiss chard, arugula, oak, frisee, spinach, mâche, etc. 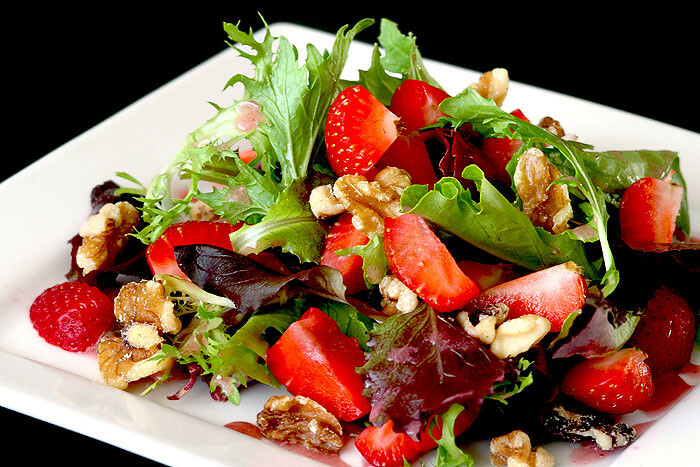 ), Strawberry slices, a few walnut pieces and raspberry vinaigrette. Enjoy! I had made something similar to this, sometime ago. But this time, I only had strawberries in the fridge and not grapes. I thought it would be fun to try it out. After all, pork and fruits always make a good combo. Well, what do you know? It was outstanding! Honestly, I still prefer the grapes but this wasn’t half bad, at all! It was fabulous with pasta. I also tried it with polenta. And now, all I have to say is… what are you waiting for? Get cookin’! Cook sausages your way. Meanwhile, in a medium-low heated saucepan, add the olive oil and cook the strawberries for about 10 minutes or until they’re almost in a jam-like consistency. Stir in the balsamic vinegar, honey, salt & pepper for another couple of minutes. Turn off heat and mix in the parsley and walnuts. Plate the sausages, top with the sauce. Serve with pasta.